HSM 805 or HSM 904: each performance category of our haulers offers options for a diverse range of applications. Whether crane body or classic cable hauler, we offer individual solutions to suit your requirements. More than 50 years of experience in the manufacture and sale of forestry machinery show that quality, service friendliness and customer orientation of our special forestry haulers meet the highest standards. HSM haulers stand for innovation, economic operation and environmentally-friendly technology – anywhere in the world. The customer orientated nature is evident in the front and rear blade. Here, HSM offers a high level of variability married with tried and tested rear blade technology and high quality finish. Our sales representatives would be delighted to offer you advice and show you our range of front and rear blades. 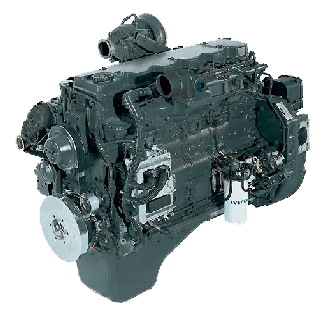 HSM offers you Iveco engines with the latest common rail technology. The balanced high performance capacity and long service life combined with the very low fuel consumption, remarkable smooth running and optimal exhaust emission values are the defining features of Iveco engines. With performance categories ranging from 100 kW to 175 kW, HSM competently meets any demand. 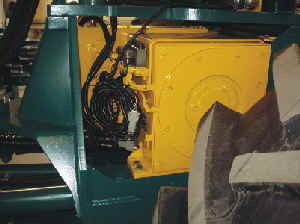 Since 2009, an additional engine is offered in the HSM 805 model series. With the Mercedes Benz OM 904LA 4-cyl. turbodiesel engine, HSM has acknowledged the call for higher output (129 kW) in the 4-cylinder range of engines while maintaining the same familiar performance figures. 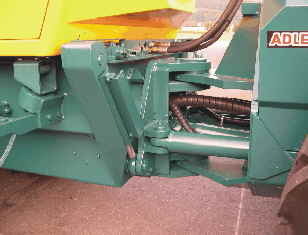 Thanks to the perfectly balanced drive concept, the high traction forces needed in every terrain are transmitted sensitively, efficiently and in a way that does not harm the ground.This combination of engine and drive system with the best features in terms of comfort, ergonomics and reliability result in optimum economy, productivity and also contribute towards environmental protection. Sustainability through ground protection - high level of care and ground protection when deploying modern forest technology. 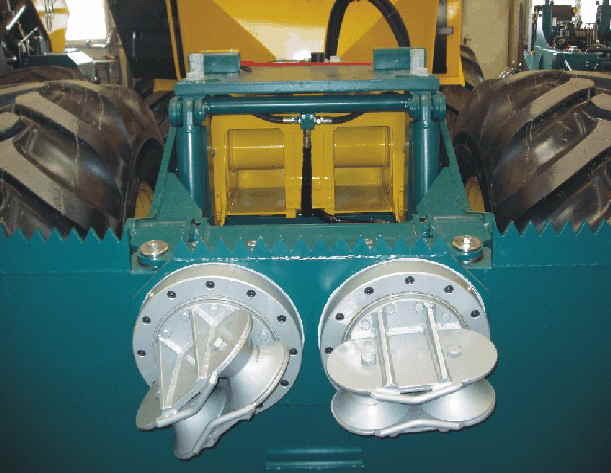 "Narrow machines with wide tyres". The human body is the measure of all things. Comfort, ergonomic design and functionality are exemplary in HSM machinery and are constantly being adapted to the latest demands. As a result, the driver can achieve maximum work output and productivity even with extended working hours. 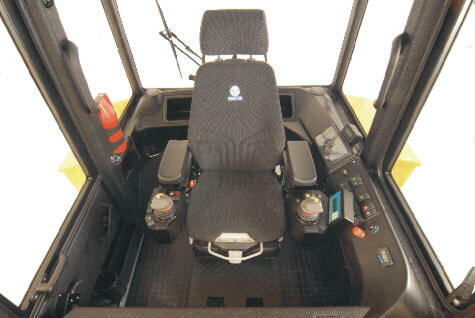 The generously configured cab with outstanding all-round view, comfortable carousel swivel seat with joystick operation and the HSM CMC system also contribute towards fatigue-free work. 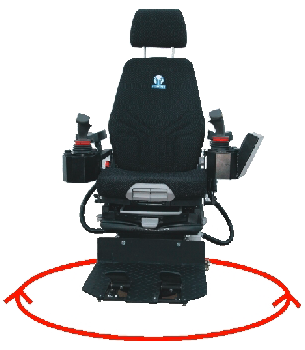 Driver's seat with pneumatic suspension, seat heating, arm rests, infinitely adjustable pedals that turn with the seat and can be locked in any position, multifunction joystick to control hydraulics and driving operation. With the complete central electrical system assigned to the right-hand side of the cab, HSM sets a standard in terms of physical and visible accessibility. The printed cables make repair work easy. The central machine control program (CMC) steers and regulates all mobile hydraulic forestry machinery applications from HSM, such as the hydrostatic drive, hydraulic steering and crane. Data transfer over CAN bus ensures lightning fast interaction of all electronics and so guarantees work with absolute sensitivity. Up to 5 different drivers can set and save all driving and work positions to suit their individual requirements. With the aid of the integrated diagnostic and calibration mode, all the important vehicle data can be retrieved on the user-friendly display without the need for diagnostic equipment or computer. 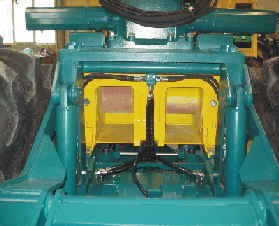 Various cranes are available depending on the forwarding machine model. Here, HSM offers tried and tested products from Epsilon and Mesera/Loglift. 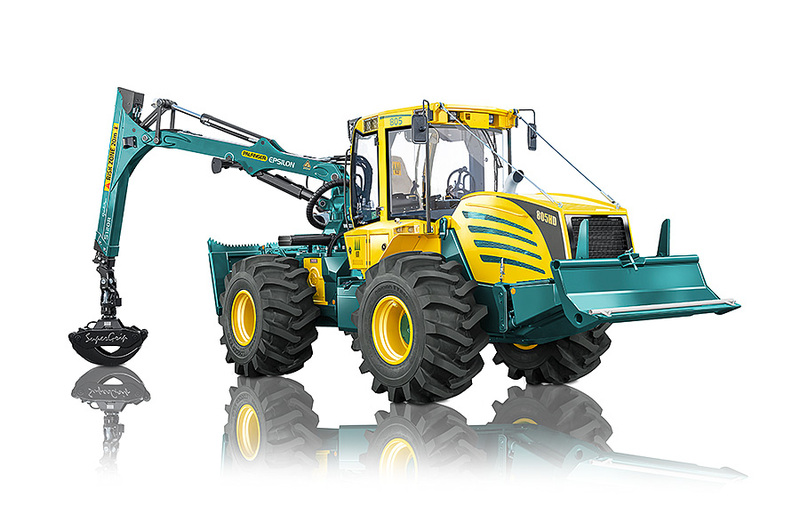 To find out which crane is possible on the individual forwarder models, refer to the technical data sheets of the individual machines or the list of accessories for cranes on special forestry haulers. Alternatively, visit the websites of either manufacturer to find the details you require. Maintaining high quality standards, including cable winch technology, is the reason why cable winches from ADLER are chosen for HSM special forestry haulers. ADLER has offered dependable and reliable cable winch technology for years and is well known far beyond the boundaries of Upper Swabia for efficient cable winches with precision control, high pulling forces and exceptionally long service life. The HSM name is synonymous these days not just with outstanding quality and innovation but also with first class service and spare parts. Our aim is to offer our customers exceptional technical assistance and parts availability in order to offer a high level of competitiveness. Our dealers and partners worldwide stake their reputation on this. During the design stage of the machines, particular attention is given to accessibility and service friendliness. This is achieved especially by the folding bonnet and the folding cab that opens out to the front at a wide angle.